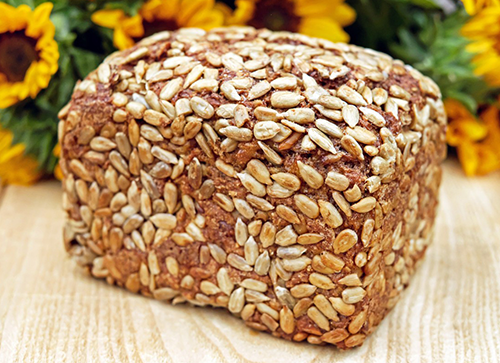 This hearty bread is a great way to start your day off with healthy fiber and protein. Because of this powerful duo, a little bit of this dense bread goes a long way and will keep you feeling satisfied for hours. For a balanced breakfast, our dietitians recommend topping a thin slice with hummus and vegetables. Combine all the ingredients together in a bowl with a wooden spoon or rubber spatula. Prepare an 8-inch by 4-inch-loaf pan with non-stick cooking spray. Line the pan with parchment paper on the bottom and the two sides. Spray the parchment paper. Bake in a 320°F oven for approximately 50 minutes or until a thermometer inserted into the center of the loaf reads 175°F. Note: Feel free to substitute nuts and seeds for those you already have in your kitchen, in even quantities.